There’s a lot to admire about Switzerland, particularly compared to its profligate neighbors. It has a spending cap, imposed in a landslide referendum early last decade, that has constrained the growth of government. 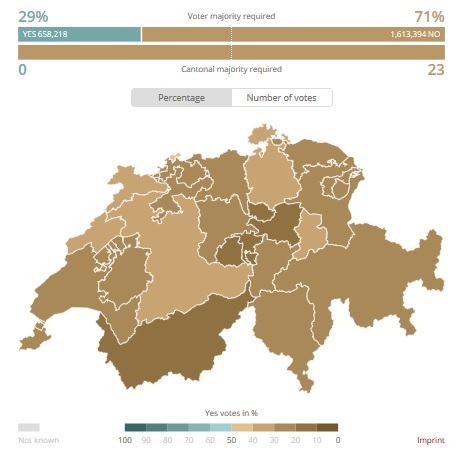 It has a genuinely decentralized system with a very small central government and vigorous competition among cantons. There’s widespread gun ownership, and the number of guns owners keeps expanding. It has strong human rights laws protecting financial privacy (though unfortunately has been bullied into weakening protections for non-Swiss investors). It has comparatively modest tax rates and a relatively low level of redistribution. With all these features, you won’t be surprised to learn that Switzerland is highly ranked by Human Freedom Index (#2), Economic Freedom of the World (#4), Index of Economic Freedom (#4), Global Competitiveness Report (#1), Tax Oppression Index (#1), and World Competitiveness Yearbook (#2). Today let’s augment our list of good Swiss policies for reviewing the near-universal system of private pensions. 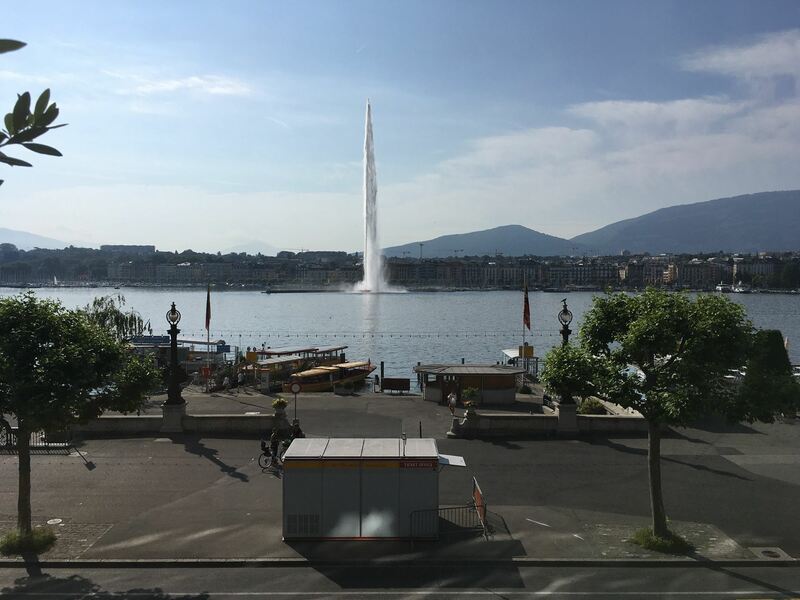 I’ve been in Switzerland this week for a couple of speeches in Geneva, as well as interviews and meetings in Zurich and Bern. As part of my travels around the country, I took the time to learn more about the “second pillar” of the country’s pension system. Here’s a basic description from the Swiss government (with the help of Google translate). The first pension funds were founded more than a hundred years ago… In 1972 the occupational pensions were included in the constitution. There it represents the second column in the three-column concept… The BVG compulsory scheme applies to all employees who are already insured in the first pillar… Pension provision in the second pillar is based on an individual savings process. This starts at 25 years. However, the condition is an annual income that exceeds the threshold (since 2015: 21’150 francs). The savings process ends with the reaching of the pension age. The accumulated savings in the individual account of the insured [are] used to finance the retirement pension. If you want something in original English, here’s a brief description from the Swiss-American Chamber of Commerce. The second pillar is governed by the provisions of the laws on occupational pension provision (BVG)… Employees who are paid by the same employer an annual salary exceeding CHF 21,150 are subject to compulsory insurance. The share of the salary which is subject to compulsory insurance is…between CHF 24,675 (the coordination deduction) and CHF 84,600… An employer who employs persons subject to compulsory insurance must be affiliated to a provident institution entered in the register for occupational benefit plan. The contributions into the pension scheme depend on age and include a minimum saving portion of 7% – 18% of the coordinated salary plus a risk portion. Both are equally shared between employer and employee. The benefits of the insured persons consist in the old age, invalidity and survivors pensions. One of the interesting quirks of the system is that the mandatory contribution rate changes with age. The older you are, the more you pay. I’m not sure that makes a lot of sense if the goal is for people to have big nest eggs when they retire, but nobody asked me. In any event, here’s a table showing the age-dependent contribution rates from an OECD description of the Swiss system. Technically speaking, the contributions are evenly split between employees and employers, though labor economists widely agree that workers bear the real cost. It’s also worth noting that the Swiss system is based on “defined contribution” like the Chilean and Australian private retirement systems. This means retirement income generally is a function of how much is saved and how well it is invested. By contrast, the Dutch private system is based on “defined benefit,” which means that workers get a pre-determined level of retirement income. As evidenced by huge shortfalls in the defined benefit regimes maintained by many public and private employers in the United States, this approach is very risky if there aren’t high levels of integrity and honesty. Though that doesn’t seem to be a problem in the Netherlands. Speaking of the Dutch system, here’s a chart I shared back in 2014. It was designed to laud the Netherlands, but you can see that Switzerland also had a large pool of pension assets, equal to more than 110 percent of GDP (according to OECD data, now 123 percent of GDP). 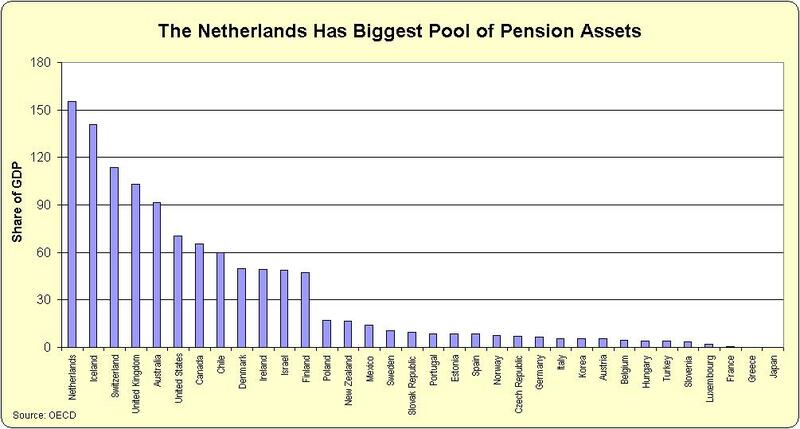 Looking at this data, ask yourself whether Switzerland (or the Netherlands, Iceland, Australia, etc) will be in a stronger position to handle the fiscal challenge of aging populations, particularly when compared to nations with virtually no private pension assets, such as France, Greece, and Japan. The Swiss regime certainly isn’t perfect, and neither are the systems in other nations with private retirement savings. But at least those nations are in much better shape to deal with future demographic changes. Workers in Switzerland and other countries with similar systems have real assets rather than unsustainable political promises. And it’s also worth pointing out that there are macroeconomic benefits for nations that rely more on private savings rather than tax-and-transfer entitlement schemes. In other words, the Swiss system is much better than America’s bankrupt Social Security scheme. P.S. Back in 2011, I compared five good features of the United States to five good features of Switzerland. If retirement systems were part of that discussion, Switzerland would have enjoyed a sixth advantage. P.P.S. Switzerland does have some warts. It is only ranked #31 in the World Bank’s Doing Business. It also has a self-destructive wealth tax. And government spending, though modest compared to neighbors, consumes slight more than one-third of economic output. Time for a boring and wonky discussion about taxes, capital formation, and growth. We’ll start with the uncontroversial proposition that saving and investment is a key driver of long-run growth. Simply stated, employees can produce more (and therefore earn more) when they work with better machines, equipment, and technology (i.e., the stock of capital). But if we want to enjoy the higher incomes that are made possible by a larger and more productive capital stock, somebody has to save and invest. And that means they have to sacrifice current consumption. The good news is that some people are willing to forego current consumption if they think that saving and investment will enable them to have higher levels of future consumption. In other words, if they make wise investments, it’s a win-win situation since society is better off and they are better off. And these investment decisions help drive financial markets. Now let’s focus specifically on long-run investments. If you have some serious money to invest, one of your main goals is to find professionals who hopefully can identify profitable opportunities. You want these people, sometimes called “fund managers,” to wisely allocate your money so that it will grow in value. And in some cases, you try to encourage good long-run investments by telling fund managers that if your investments increase in value (i.e., earn a capital gain), they get to keep a share of that added wealth. In the world of “private equity” and “venture capital,” that share of the added wealth that goes to fund managers is known as “carried interest.” And as a Bloomberg article notes, it has played a big role in some of America’s great business success stories. Venture capitalists…helped transform novel business ideas into some of the world’s most valuable companies, including Apple, Alphabet Inc., Amazon.com Inc., Facebook Inc., and Microsoft Corp. According to a 2015 study by Stanford University, 43 percent of public U.S. companies founded since 1979 had raised venture cash. An article from the National Center for Policy Analysis has some additional data on the key role of investors who are willing to take long-run risks. …up to 25 percent of pre-initial public offering (preIPO) startup funding comes from private equity or venture capital backers. Increasing the tax burden on these entities would damage a valuable access-to-capital pipeline for some startups — particularly in the energy, technology and biotech sectors where large up-front investments could be required. The obvious conclusion is that we should be happy that there are people willing to put their money in long-run investments and that we should not be envious if they make good choices and therefore earn capital gains. And most people (other than the hard-core left) presumably will agree that people who take big risks should be able to earn big rewards. That consensus breaks down, however, when you add taxes to the equation. There’s the big-picture debate about whether there should be “double taxation” of income that is saved and invested. There are two schools of thought. On one side, you have proponents of “consumption-base” taxation, and they favor reforms such as the flat tax that eliminate the tax code’s bias against saving and investment. These people want to eliminate double taxation because a bigger capital stock will mean a more prosperous economy. Advocates of this approach generally believe in equality of opportunity. On the other side, you have advocates of the “Haig-Simons” or “comprehensive income tax” approach, which is based on the notion that extra layers of tax should be imposed on income that is saved an invested. These people want double taxation because it is consistent with their views of fairness. Advocates of this approach generally believe in equality of outcomes. In the United States, we’ve historically dealt with that debate by cutting the baby in half. We have double taxation of capital gains and dividends, but usually at modest rates. We have double taxation of interest, but we allow some protection of savings if people put money in IRAs and 401(k)s.
But the debate never ends. And one manifestation of that ongoing fight is the battle over how to tax carried interest. Folks on the left want to treat carried interest as “ordinary income,” which simply means that they want regular tax rates to apply so that there’s full double taxation rather than partial double taxation. So who supports such an idea? To quote Claude Rains in Casablanca, it’s the usual suspects. Strident leftists in Congress and their ideological allies are pushing this version of a capital gains tax hike. Rep. Sander Levin (D-Mich.), Sen. Tammy Baldwin (D-Wis.) and a group of millionaires made a push on Wednesday for consideration of legislation to close the carried-interest tax “loophole.” “We have to eliminate this loophole to make that sure everyone is paying their fair share and especially so that we can invest in an economy that creates jobs and lifts working American wages,” Baldwin said during a news conference on Capitol Hill. …The carried interest tax break is “the most egregious example of tax unfairness,” said Morris Pearl, chair of the Patriotic Millionaires — a group of 200 Americans with annual incomes of at least $1 million and/or assets of at least $5 million. Folks on the right, by contrast, don’t think there should be any double taxation. And that means they obviously don’t favor an increase in the double taxation on certain types of capital gains. And that included carried interest, which they point out is not some sort of “loophole.” As Cliff Asness has explained, the treatment of carried interest is “consistent with the way employee-incentive stock options and professional partnerships are taxed. But this isn’t just a left-right issue. Some so-called populists want higher capital gains taxes on carried interest, including the President-Elect of the United States. Kevin Williamson of National Review is not impressed. Trump doesn’t understand how our economy works. …The big, ugly, stupid tax hike he’s planning is on Silicon Valley and its imitators around the country, the economic ecosystem of startup companies and the venture capitalists who put up the cash to turn their big ideas into viable products, dopey computer games, social-media annoyances, and companies that employ hundreds of thousands of people at very high wages. Which is to say, he wants to punish the part of the U.S. economy that works, for the crime of working. The so-called carried-interest loophole, which isn’t a loophole, drives progressives batty. Kevin points out how carried interest works in the real world. If you’re the cash-strapped startup, you go to venture capitalists; if you’re the established business, you go to a private-equity group. In both cases, the deal looks pretty similar: You get cash to do what you need to do, and the investor, rather than lending you money at a high interest rate, takes a piece of your company as recompense (for distressed companies being reorganized by private-equity firms, that’s usually 100 percent of the firm) on the theory that this will be worth more — preferably much more – than the money they put into your business. Eventually, the investor sells its stake in the company and pays the capital-gains tax on its capital gain. And he doesn’t hold Trump in high regard. Donald Trump does not understand this, because he isn’t a real businessman — he’s a Potemkin businessman, a New York City real-estate heir with his name on a lot of buildings he doesn’t own and didn’t build and whose real business is peddling celebrity and its by-products. He’s a lot more like Paris Hilton than he is like Henry Ford or Steve Jobs. Miss Hilton sells perfumes and the promise of glamour, Trump sells ugly neckties and the promise of glamour. In her syndicated column, Veronique de Rugy explains why Republicans shouldn’t make common cause with the class-warfare crowd. Trump…has seemingly swallowed a key assumption of the left. During the campaign, Trump and Hillary Clinton both pledged to raise taxes on carried interest. …sensing an opening, Senate Minority Leader Chuck Schumer recently indicated that he’d be willing to work with Trump on the issue. Of course he would. Democrats have been trying for years to raise taxes on capital. In fact, they see the reduced rate on all capital gains as a loophole. Their goal is to treat all capital gains as ordinary income because they want higher tax burdens overall. …Republicans need to remember that the left’s goal is not fairness but higher taxes. Treating carried interest as ordinary income for tax purposes would simply be the first step toward higher taxes on capital in general. That would be bad for economic growth and for our wallets. Chuck Devore of the Texas Public Policy Foundation also has a sensible take on the economics of this issue. …If the investment professional sees his marginal tax rate on capital gains from carried interest almost double, from 23.8 percent to 43.4 percent, he’ll change his behavior and charge more for his services. Pension funds and colleges will get less… Increasing taxes on investment success would mean less investment and consequently, fewer jobs, less innovation, and less prosperity. According to the Tax Foundation, the U.S. already levies the 6th-highest capital gains taxes among the 34 developed nations of the Organization for Economic Co-operation and Development… Generating capital gains means that money was used efficiently, benefiting not just the professional investment manager, but savers and the world. Losing money, on the other hand, is nothing to celebrate. The carried interest right is really a proxy for the bigger issue of whether there should be increased double taxation of capital gains. Which would be the exact opposite of what should happen if we want America to be more competitive and prosperous. For more background on the issue of carried interest, this video from the Center for Freedom and Prosperity is very succinct and informative. And if you want more info on the overall issue of capital gains taxation, I’m quite partial to my video on the topic. Because of the budgetary implications, I think it’s more important to deal with Medicaid and Medicare than it is to address Social Security. If left on autopilot, Social Security will eventually consume an additional 2 percent of the private economy. That’s not good news, but Medicaid (which now includes a big chunk of Obamacare) and Medicare are much bigger threats. Hopefully, though, we don’t need to engage in fiscal triage and we can reform all the big entitlement programs. 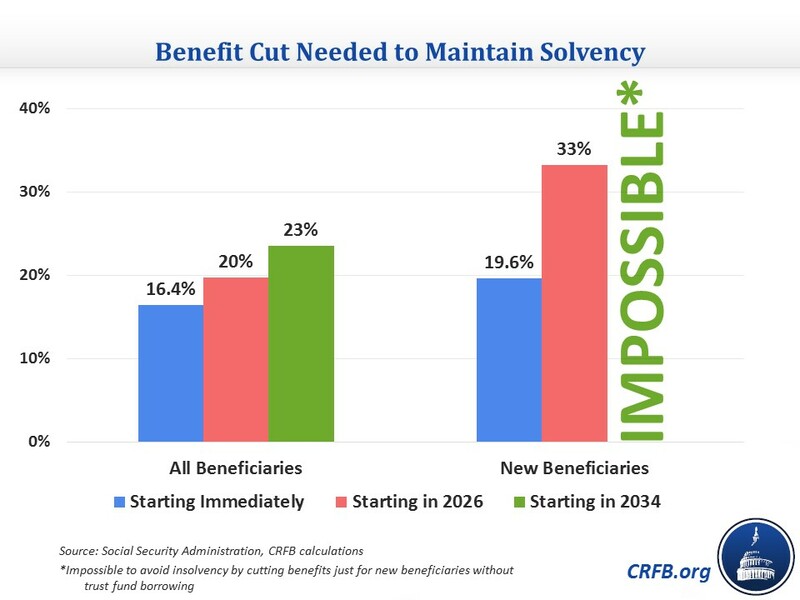 So let’s look at why Social Security needs to be modernized. First and foremost, the programs is about $40 trillion in the red. And that’s after adjusting for inflation! Moreover, the longer we wait, the more difficult reform will be. I don’t always agree with the policy prescriptions of the Committee for a Responsible Budget, but they are very sober-minded in their analysis. And this chart from one of their recent publications shows that waiting until 2026 or 2034 will require more radical changes. So it should be obvious we need reform, but now the question is what kind of reform. Some people think the key goal is making the program solvent, but that’s the wrong focus. Sort of like making balance the goal of budgetary policy. Instead, the goal should be creating a freer society and smaller footprint for government. And that’s why I think personal retirement accounts are the right goal. And to understand the implications, consider these excerpts from a column in today’s Wall Street Journal. Professor Jeremy Siegel of the University of Pennsylvania explains how the Social Security system has made his retirement less comfortable. Last month I turned 70 and, thanks to my earnings, became entitled to Social Security’s maximum benefit, currently $3,500 a month, or $42,000 a year. And so, if I live to 90, I will receive $840,000 worth of (inflation-adjusted) benefits. Over the past 50 years, according to the Social Security Administration, the combined taxes paid into the system by me and my employers equaled $329,640. This sounds like a good deal… But the benefits are only about one-third the $2.27 million I would have accumulated had the taxes instead been invested, over time, in a stock index fund. …the benefits I would collect are even less than the $1.28 million I would have accumulated if my “contributions,” as Social Security taxes are euphemistically called, had been placed in U.S. Treasury bonds. …are affluent seniors making out like bandits? Not at all. The bandit is the federal government, which provides benefits that are millions of dollars short of what anyone whose earnings are at or above the tax cap easily could have accumulated on his own. In effect, Professor Siegel has been forced to pay for a steak and he’s getting a hamburger. Which is a good description of how all entitlement programs operate. And it’s not just high-income people who get a bad deal. Social Security is particularly bad for young people. And many minorities also are disadvantaged because of their shorter life lifespans. Moreover, everyone will pay more for their steak and get even less hamburger if politicians deal with the program’s giant shortfall by imposing the wrong type of reform. But it’s not just that Social Security is bad for individuals. It’s also a burden on the overall economy. …fixing Social Security by raising taxes – or, going further, expanding Social Security as many progressives favor – won’t increase retirement income so much as shift it from households to government. …A new report from Canada’s Fraser Institute looks at how Canadian households’ personal saving habits responded to increases in the tax rates used to finance the Canada Pension Plan (CPP). …The Fraser study, authored by Charles Lammam, François Vaillancourt, Ian Herzog and Pouya Ebrahimi, found that for each dollar of additional CPP contributions, Canadian households reduced their personal saving by around 90 cents. As a result, total saving – and thus total future retirement income – would increase by a lot less than you’d think. Households would receive more income from the CPP but less from their own saving. These results are similar to what’s been found in other nations. 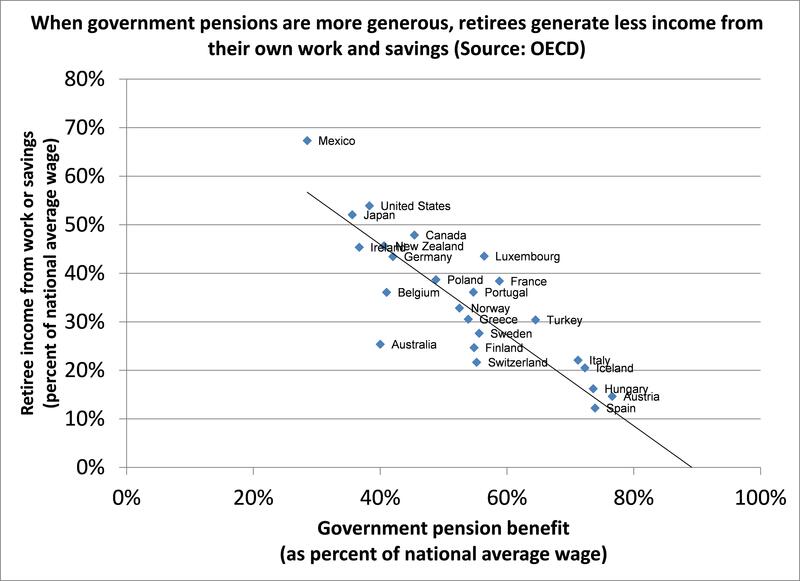 I found a similar result across OECD countries: when a country’s government provided an additional dollar of retirement benefits, retirees provided for themselves about 93 cents less in income from savings and work in retirement. …a 2003 analysis by Suzanne Rohwedder and Orazio Attanasio which found that, for the United Kingdom’s earnings-related pension system, individuals reduced personal saving by 65 to 75 cents for each dollar of benefits they expected to receive from the government. Here’s a very powerful chart on the relationship between private savings and government retirements benefits from another one of Andrew’s articles. Wow, that’s a powerful relationship. And Biggs isn’t the only expert to produce these results. All of which underscores why I think we should have a system similar to what they have in Australia or Chile (or even the Faroe Islands). Here’s my video making the case for personal retirement accounts. P.S. Two economists at the Federal Reserve produced a study examining why Social Security was first created. It might seem obvious that it was a case of politicians trying to buy votes by creating dependency, but they actually go through the calculations in order to explain how it made sense (from the perspective of people alive at the time) to create a program that now undermines the well-being of the nation. A well-established result in the literature is that Social Security tends to reduce steady state welfare in a standard life cycle model. However, less is known about the historical effects of the program on agents who were alive when the program was adopted. …we estimate that the original program benefited households alive at the time of the program’s adoption with a likelihood of over 80 percent, and increased these agents’ welfare by the equivalent of 5.9% of their expected future lifetime consumption. …Overall, the opposite welfare effects experienced by agents in the steady state versus agents who experienced the program’s adoption might offer one explanation for why a program that potentially reduces welfare in the steady state was originally adopted. Gee, what a shocker. Ponzi schemes benefit people who get in at the beginning of the scam. P.P.S. Speaking of Ponzi schemes, here’s the case for reform, as captured by cartoons. And you can enjoy other Social Security cartoons here, here, and here, along with a Social Security joke if you appreciate grim humor. P.P.P.S. I’m not sure whether Hillary’s plan or Obama’s plan for Social Security would be worse. I repeatedly try to convince people that the welfare state is bad for both taxpayers and poor people. Sometimes I’ll add some more detailed economic analysis and explain that redistribution programs undermine growth by reducing labor supply (with Obamacare being the latest example). And I’ve even explained that the welfare state has a negative impact on savings and wealth accumulation (these dramatic charts show Social Security debt in America compared to ever-growing nest eggs in Australia’s private pension system). But if new research from the European Central Bank (ECB) is any indication, I should be giving more emphasis to this final point. Culling from the abstract, here’s the key finding from the working paper by Pirmin Fessler and Martin Schürz. …multilevel cross-country regressions show that the degree of welfare state spending across countries is negatively correlated with household net wealth. These findings suggest that social services provided by the state are substitutes for private wealth accumulation and partly explain observed differences in levels of household net wealth across European countries. Here are details from the study. We regress net wealth on income…and add welfare state country level variables. 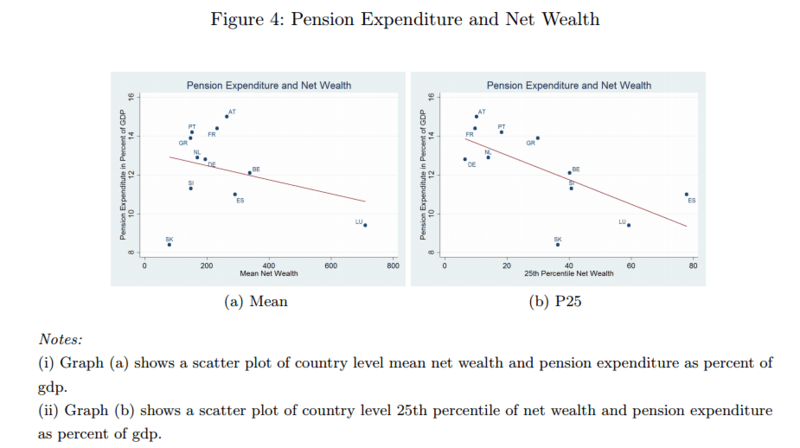 …The main result of these hierarchical linear models is that pension and social security expenditure measured as shares of GDP show significant and negative correlation with household net wealth levels. …We regard this as evidence that welfare state expenditures indeed act as substitutes for private wealth accumulation and explain partly observed differences in household net wealth among euro area countries. A larger and more active welfare state leads to less need for private households to accumulate private wealth. Here’s a pair of graphs from the study, showing the negative relationship between government-provided pensions and private wealth. Now here’s the part that should make honest leftists more open to entitlement reform. The data show that the welfare state increases inequality! The effect of a 1 percentage point increase in state pension expenditure as a share of GDP on net wealth is a decrease about 20% less wealth for households around the 10th net wealth percentile. The size of the negative impact is smaller for wealthier households, but remains at above 10% of net wealth. Social security expenditure shows a similar but somewhat weaker effect, ranging at around 10% at the 10th net wealth percentile and coming close to zero for the wealthiest. …we see a decrease in net wealth of 47% for the low wealth household, of 16% for the middle wealth household, and 8% for the high wealth household. These numbers are roughly in line with our results… Additional welfare state spending is negatively associated with all wealth levels but decreasing in size relative to wealth across the full net wealth distribution. …this mechanism would lead to increased observed inequality of private net wealth given an increase of welfare state activity. Those are some damning results. And the numbers might be even worse in the United States since many minorities already are screwed by Social Security because they have shorter lifespans. P.S. Since we’re on the topic of inequality, regular readers know that I think the issue as a complete red herring. Simply stated, the goal should be faster growth and it doesn’t matter if some people get richer faster than others get richer (assuming, of course, that the rich are earning their money and not getting subsidies, bailouts, and other forms of unearned wealth). 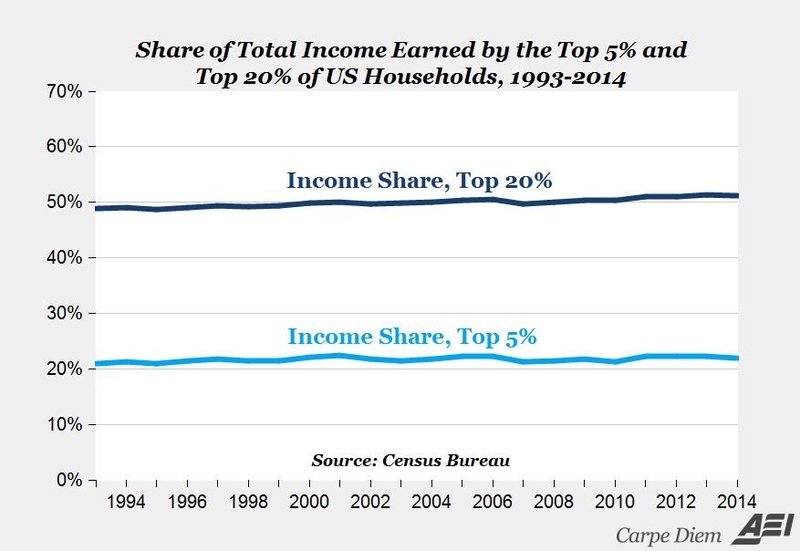 That being said, if somebody had asked me whether there had been a significant increase in inequality over the past couple of decades, I would have guessed – based on all the feverish rhetoric from our statist friends – that the answer is yes. So I was very surprised to see this chart from Mark Perry at the American Enterprise Institute. In other words, the politicians who are talking about a supposed crisis of growing inequality are spouting nonsense. And I’m ashamed I didn’t know their rhetoric is a bunch of you-know-what. That being said, if their concern about inequality is legitimate and not just for purposes of demagoguery, I expect them to read the ECB working paper discussed above and add their voice in support of a smaller welfare state and in favor of Social Security reform. P.P.S. If the New York Times can support private retirement savings (albeit by accident), then other leftists should be able to do the same thing. The standard argument against an easy-money policy is that it creates distortions in an economy that lead to either rapid increases in the price level, like we endured in the 1970s, or unsustainable asset bubbles, like we experienced last decade. Those arguments are completely valid, but they only tell part of the story. 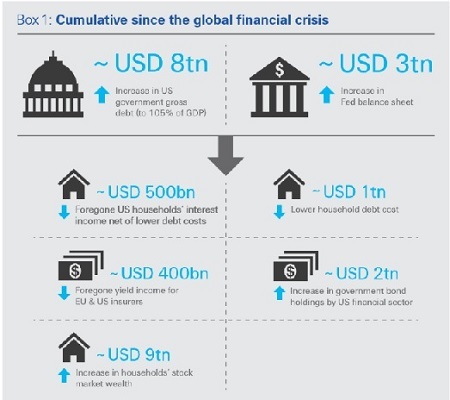 Central banks also should be criticized because “quantitative easing” and “zero interest rate policies” create major imbalances in capital markets. A major new study from Swiss Re quantifies the damage to savers. Here are some excerpts from a CNBC report. The Federal Reserve’s efforts to stimulate the U.S. economy after the financial crisis ended up costing savers nearly half a trillion dollars in interest income, according to report released Thursday. Since the central bank dropped interest rates to near zero at the end of 2008, savers have labored under plain-vanilla bank accounts and money market funds that have yielded close to nothing. …In a landmark report, Swiss Re quantifies just how much savers and others have languished… The reinsurance firm put the number at $470 billion in the 2008-13 period studied, so the number is likely even higher now. …”the impact of foregone interest income for households and long-term investors has become substantial.” …Swiss Re said the “financial repression” has taken its toll not only on savers but also on some areas of investing. 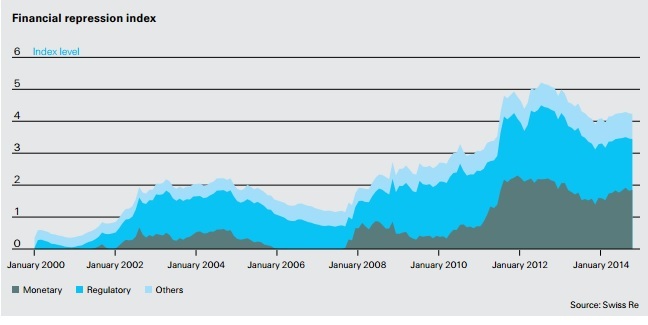 Here’s a chart from the Swiss Re report. As you can see, an easy-money policy is a massive tool for redistribution, with savers being hurt and government being subsidized. Financial repression reflects the ability of policymakers to direct funds to themselves that would otherwise go elsewhere. And the level of this repression has been at record highs in recent years. It is true that some households benefit from easy money and artificially low interest rates. Their debt expenses have been reduced and they also are enjoying higher asset values. But those benefits may be fleeting if the end result is a bubble that bursts, as happened in 2008. Writing for the Washington Times, my Cato colleague Richard Rahn agrees that central banks are hurting savers, but he augments this analysis by making the very important point that easy-money policies simply don’t work. Government economic policymakers have been trying to solve a problem of too much government spending, taxing and regulation by inappropriately using monetary policy, which has not and cannot solve the fundamental problems (it is like using a hammer rather than a shovel to dig a hole). The major central banks have been holding down interest rates, which is actually a massive indirect tax levied on the world’s savers. Historically, savers would receive about 3 percent interest above the rate of inflation on their safest investments, but now interest rates often do not cover even the low inflation that is occurring in the developed countries. …Many economists expected savers to save less and consume more as a result of low or even negative interest rates… When businesses and individuals look at the world debt situation and the increased chances of another financial collapse, their rational response is to increase “precautionary” savings, even though they are not receiving interest on them. So the bottom line is that central banks are engaging in “financial repression” today and creating risks of price instability and/or asset bubbles tomorrow. But there’s no compensating benefit to make all these costs (and future risks) worthwhile. That’s not a good deal. In the short run, the best hope is that central bankers, including the ones at the Federal Reserve, will take their feet off the figurative gas pedal and follow some sort of monetary rule that precludes destructive intervention. In the long run, the ideal answer would be a return to market-provided private currencies. This isn’t just silly libertarian fantasy. There actually have been countries that successfully used this “free banking” approach. Professor Larry White has a must-read historical review of what happened before governments monopolized currency issue. When we look into these episodes, we find a record of innovation, improvement, and success at serving money-users. As in other goods and services, competition provided the public with improved products at better prices. The least regulated systems were not only the most competitive but also by and large the least crisis-prone. …the record of these historical free banking systems, “most if not all can be considered as reasonably successful, sometimes quite remarkably so.”…Those systems of plural note issue that were panic prone, like those of pre-1913 United States and pre-1832 England, were not so because of competition but because of legal restrictions that significantly weakened banks. Where free banking was given a reasonable trial, for example in Scotland and Canada, it functioned well for the typical user of money and banking services. The history of central banking, by contrast, is not nearly as successful. There’s been massive erosion in the value of money and central banks are largely responsible for the boom-bust cycle that has afflicted many economies. At this point, you may be wondering why central banking triumphed over free banking if the latter is so superior. The answer is simple. As Professor White explains, look at what’s in the best interest of the political elite. Free banking often ended because the imposition of heavy legal restrictions or creation of a privileged central bank offered revenue advantages to politically influential interests. The legislature or the Treasury can tap a central bank for cheap credit, or (under a fiat standard) simply have the central bank pay the government’s bills by issuing new money. …Central banks primarily arose, directly or indirectly, from legislation that created privileges to promote the fiscal interests of the state or the rent-seeking interests of privileged bankers, not from market forces. In other words, a system of competitive currencies is perfectly plausible, but it’s not in the interest of politicians (just as having no income tax is plausible, but also not in the interest of politicians). For more information on free banking, here’s a video I narrated for the Center for Freedom and Prosperity. Professor White also has a good video explaining why a central bank isn’t needed. P.S. For those of you who like the gold standard, Professor George Selgin (now head of Cato’s Center for Monetary and Financial Alternatives) has some major concerns (at least if the government is in charge of it). P.P.S. Don’t forget that the Federal Reserve also imposes a lot of costly regulation on the financial sector. P.P.P.S. Thomas Sowell has some wise observations on why we shouldn’t grant more power to the Fed and John Stossel explains why monetary competition would be good. P.P.P.P.S. To end with some humor, here’s the famous “Ben Bernank” video. And if that doesn’t exhaust your interest in the topic, here’s a snarky cartoon video mocking the Fed and another video with 10 reasons to dislike the Fed. In my 2012 primer on fundamental tax reform, I explained that the three biggest warts in the current system. 1. High tax rates that penalize productive behavior. 2. Pervasive double taxation that discourages saving and investment. 3. Corrupt loopholes and cronyism that bribe people to make less productive choices. These problems all need to be addressed, but I also acknowledged additional concerns with the internal revenue code, such as worldwide taxation and erosion of constitutional freedoms an civil liberties. In a perfect world, we would shrink government to such a small size that there was no need for any sort of broad-based tax (remember, the United States prospered greatly for most of our history when there was no income tax). In a good world, we could at least replace the corrupt internal revenue code with a simple and fair flat tax. In today’s Washington, the best we can hope for is incremental reform. But some incremental reforms can be very positive, and that’s the best way of describing the “Economic Growth and Family Fairness Tax Reform Plan” unveiled today by Senator Marco Rubio of Florida and Senator Mike Lee of Utah. The two GOP senators have a column in today’s Wall Street Journal, and you can read a more detailed description of their plan by clicking here. But here are the relevant details. In the interest of fairness, I’ll start with the most disappointing feature of the plan. The top tax rate will be 35 percent, only a few percentage points lower than the 39.6 percent top rate that Obama imposed as a result of the fiscal cliff. Even more troubling, that 35 percent top tax rate will be imposed on any taxable income above $75,000 for single taxpayers and $150,000 for married taxpayers. Since the 35 percent and 39.6 percent tax rates currently apply only when income climbs above $400,000, that means a significant number of taxpayers will face higher marginal tax rates. This will be a much longer section because there are several very attractive features of the Rubio-Lee plan. Some households, for instance, will enjoy lower marginal tax rates under the new bracket structure, particularly if those households have lots of children (there’s a very big child tax credit). But the really attractive features of the Rubio-Lee plan are those that deal with business taxation, double taxation, and international competitiveness. Here’s a list of the most pro-growth elements of the plan. A 25 percent tax rate on all business income – This means that the corporate tax rate is being reduced from 35 percent (the highest in the world), but also that there will be a 25 percent maximum rate on all small businesses that file using Schedule C as part of a 1040 tax return. Sweeping reductions in double taxation – The Rubio-Lee plans eliminates the capital gains tax, the double tax on dividends, and the second layer of tax on interest. Full expensing of business investment – The proposal gets rid of punitive “depreciation” rules that force businesses to overstate their income in ways that discourage new business investment. Territorial taxation – Businesses no longer will have to pay a second layer of tax on income that is earned – and already subject to tax – in other nations. No death tax – Income should not be subject to yet another layer of tax simply because someone dies. The Rubio-Lee plan eliminates this morally offensive form of double taxation. In addition, it’s worth noting that the Rubio-Lee plan eliminate the state and local tax deduction, which is a perverse part of the tax code that enables higher taxes in states like New York and California. 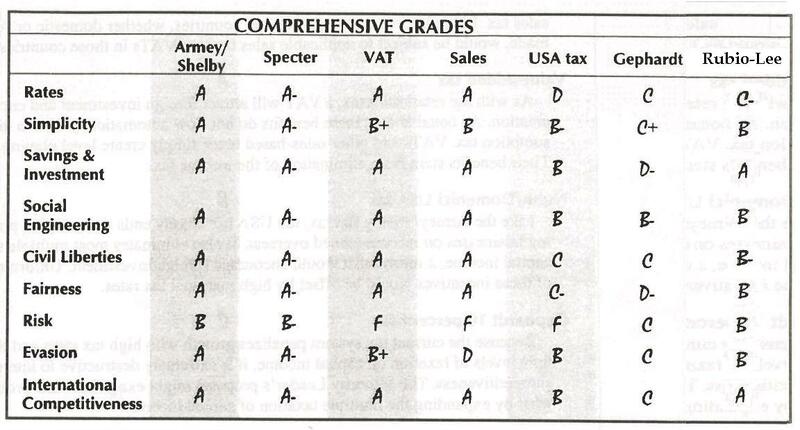 Many years ago, while working at the Heritage Foundation, I created a matrix to grade competing tax reform plans. I updated that matrix last year to assess the proposal put forth by Congressman Dave Camp, the former Chairman of the House Ways & Means Committee. Here’s another version of that matrix, this time including the Rubio-Lee plan. And since these components have big implications for growth, the proposal would – if enacted – generate big benefits. The economy would grow faster, more jobs would be created, workers would enjoy higher wages, and American companies would be far more competitive. By the way, if there was (and there probably should be) a “tax burden” grade in my matrix, the Rubio-Lee plan almost surely would get an “A+” score because the overall proposal is a substantial tax cut based on static scoring. And even with dynamic scoring, this plan will reduce the amount of money going to Washington in the near future. Of course, faster future growth will lead to more taxable income, so there will be revenue feedback. So the size of the tax cut will shrink over time, but even a curmudgeon like me doesn’t get that upset if politicians get more revenue because more Americans are working and earning higher wages. That simply means another opportunity to push for more tax relief! There are a few features of the tax code that aren’t addressed in the plan. The health care exclusion is left untouched, largely because the two lawmakers understand that phasing out that preference is best handled as part of a combined tax reform/health reform proposal. Some itemized deductions are left untouched, or simply tweaked. And I’m not aware of any changes that would strengthen the legal rights of taxpayers when dealing with the IRS. Let’s close with a reminder of what very good tax policy looks like. To their credit, Rubio and Lee would move the tax code in the direction of a flat tax, though sometimes in a haphazard fashion. P.S. There is a big debate on the degree to which the tax code should provide large child credits. As I wrote in the Wall Street Journal last year, I much prefer lower tax rates since faster growth is the most effective long-run way to bolster the economic status of families. But even the flat tax has a generous family-based allowance, so it’s largely a political judgement on how much tax relief should be dedicated to kids and how much should be used to lower tax rates. That being said, I think the so-called reform conservatives undermine their case when they argue child-oriented tax relief is good because it might subsidize the creation of future taxpayers to prop up entitlement programs. We need to reform those programs, not give them more money. Last week, I shared a TV interview about Obama’s budget, but much of the discussion was routine and didn’t warrant special attention. But there was one small part of the interview, dealing with the silly claim that America became a rich nation because of socialism, that got me all agitated. Well, to quote the great Yogi Berra, it’s deja vu all over again. Here’s an interview I did with CNBC about labor unrest. As you might expect, I made the standard libertarian argument that it’s not the job of government to pick sides when labor and management have squabbles. That’s a point I’ve made before (here, here, here, here, here, and here), so there’s no need to elaborate on that issue. But if you pay attention at the 3:00 mark of the video, you’ll notice that the discussion shifts to income inequality. And this is what got me agitated. I’m completely baffled that some people think that redistribution is more important than growth. As I point out in the interview, nobody wins in the long run if you have a stagnant economy and politicians are fixated on re-slicing a shrinking pie. The goal of everyone – including unions and leftist politicians – should be growth. If we get robust growth, that will mean tight labor markets, and that’s a big cause of rising wages. But here’s my hypothesis to explain why statists don’t support good policies. Simply stated, I think they hate the rich more than they like the poor. That sounds like a rather bold claim, but is there any other explanation for why they reject the types of tax policies (such as lower corporate rates, reduced double taxation, and expensing) that will increase investment, thus boosting productivity and wages? Heck, look at this chart showing the relationship between capital formation and labor compensation. Any decent person, after looking at the link between capital and wages, should be clamoring for the flat tax. Yet Obama wants to move the tax code in the opposite direction! I confess that I have no idea if this is because of malice or ignorance, but I do know that no nation has ever generated faster growth with class warfare. I realize I’m ranting, but the more I think about this topic, the more upset I get. Politicians and their allies are making life harder for workers, and I hope I never stop being outraged when that happens. P.S. On a totally separate subject, here’s a good joke forwarded to me by a friend this morning. It definitely belongs in my collection of gun control humor. A state trooper in Kansas made a traffic stop of an elderly lady for speeding on U.S. 166 just East of Sedan, KS. He asked for her driver’s license, registration, and proof of insurance. The lady took out the required information and handed it to him. In with the cards, he was somewhat surprised (due to her advanced age) to see she had a concealed carry permit. He looked at her and asked if she had a weapon in her possession at this time. She responded that she indeed had a .45 automatic in her glove box. Something, body language, or the way she said it, made him want to ask if she had any other firearms. She did admit to also having a 9mm Glock in her center console. Now he had to ask one more time if that was all. She responded once again that she did have just one more, a .38 special in her purse. You can enjoy other examples of gun control humor by clicking here, here, here, here, here, and here.